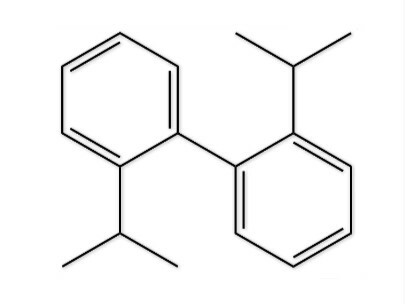 Diisopropyl biphenyl is a colorless and odorless transparent liquid that is the new carbonless copy paper dye solvent, which has advantages of proper viscosity, strong solvent power and low cost. Diisopropyl biphenyl is used to produce carbonless copy paper and pressure-sensitive carbon materials which have clear and tight prints. It is also the raw material of manufacturing high temperature heat transfer fluid, vacuum pump oil, lubricating oil and electric insulating oil, dye mordant, surface active material, synthetic fiber and plastics. Stored in cool and ventilative place. Keep away from fire, high temperature, oxidizing agent and food. Diisopropyl biphenyl is a new carbonless copy paper dye solvent, which has advantages of proper viscosity, strong solvent power and low cost. Based on low production cost, easy product availability and technique reliability, it is used to produce carbonless copy paper and pressure-sensitive carbon materials which have clear and tight prints. Diisopropyl biphenyl is also used as ceramic ink solvent, which has good compatibility, wettability and tackability. It is also the raw material of manufacturing high temperature heat transfer fluid, vacuum pump oil, lubricating oil and electric insulating oil, dye mordant, surface active material, synthetic fiber and plastics. Zhongneng Chemical attaches great importance to protecting your privacy. For more information, please visit the Privacy Statement. If you provide your personal information, you agree to comply with the terms and conditions of the privacy statement.